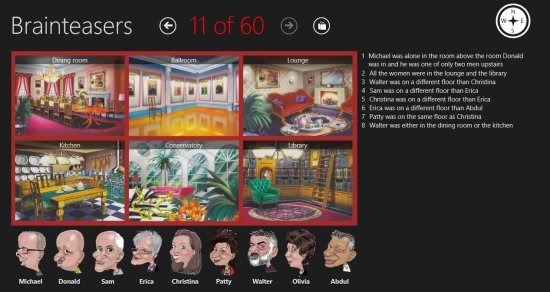 Brainteasers is a free Windows 8 detective game app; placed under the games category of Windows Store. Explore your detective skills with this detective game app. Brainteasers is a puzzle solving game, in which you have to find the culprit in every scene. 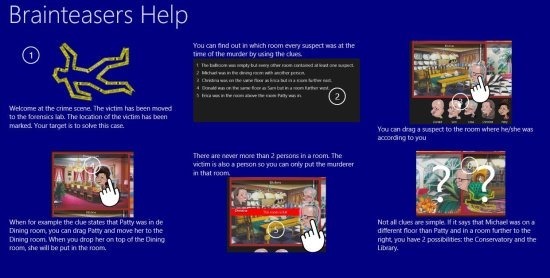 Go through these puzzles and solve the problem in every crime scene. Prove yourself as a smart detective. 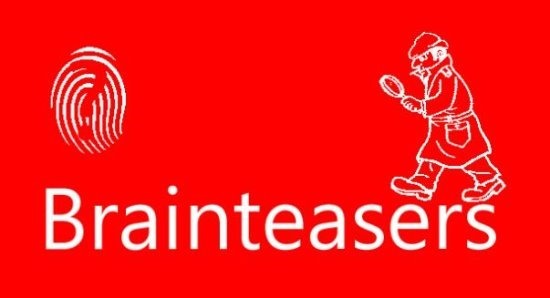 Brainteasers is a good brain exercising game for those who like to solve puzzles or crime questions. The game is very simple to play, let’s know how. First after launching the app, you will see certain rooms and characters and some lines written on the right (as shown in below picture). You may also notice that the directions: North, East, West, and South are also given. First of all just go through the matter that is given on the right. You can see that the matter includes the character names and the puzzle scenario. So, follow the hints and drag the characters to desired location in the crime scene. You can also take notes by right clicking on the app and you will find options for: notes, reset, and settings. Use the notes option to take notes, reset option for resetting the puzzle, and settings option to open the settings of brainteasers game. On top, click on the arrow marks to navigate to next or previous crime scenes. The icon beside that is for finding help regarding Brainteasers game (which looks like below image). Now after reading the puzzle, just place the characters according to your understanding. Drag the characters and place them in the rooms according to the reading from the clues. Then at last you can see that the culprit will be placed in the location where actual crime scene took place. Then the game will indicate that your answer is right, saying “That’s right. Someone is the killer.”. So, once you are done with a crime scene move on to the next scene and solve puzzles there. 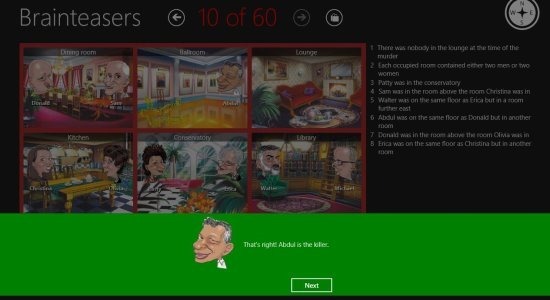 This Windows 8 detective game app is free. Read clues and find killers. Can also take notes to remember things. The app is easy to use but the game is tough to play. Open this link and click on View the app in Windows Store. The Windows Store app will open up and there just click on Install to start installing the app. After installing, just open the app and start playing Brainteasers! Also try other games like: Chess for Windows 8, Endless Skater App, or Flash Cards game app. There seems to be more than one solution for some puzzles, but if you don’t get the “right” one, it tells you that you have done something wrong. What’s up with that?